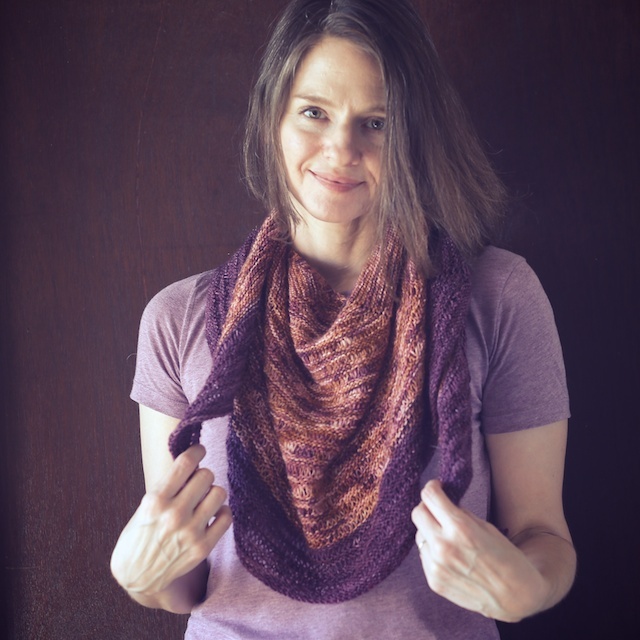 Do you know how long I have waited to make Shannon Cook's Laylow shawl? I think I ordered yarn for it before my pattern booklet came in. Then I just took the yarn out every once in a while to look at it until the day I cast on. This project name is in reference to Gilmore Girls, hence all of the Gilmore Girl linkage at the bottom of the post. 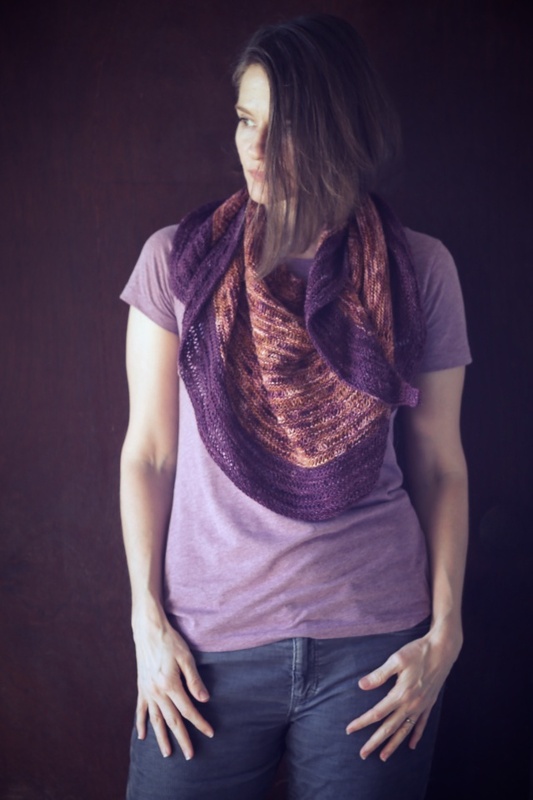 The pattern is from Seasonless by Shannon Cook and Jane Richmond. The whole collection has a real relaxed, weekend feel to it. It was released in a beautiful ebook, with photos taken by Jane's brother Nicholas Kupiak (who also photographed Island and Journey) and as a limited edition print booklet. I believe Nicholas' work is what forced me to break my ebooks-only rule for knitting patterns. I was attempting to cut down on the clutter in my home by stopping the influx of books. But, how could I not get print copies of these lovely collections? I figure my daughter will be moving out soon, so her room can be my library. Back to the pattern. You may remember that I'm fairly new to shawl knitting. I live where it's warm, or hellish, and I only wore knits when it was really cold. Because when it gets cold here, I'm really cold. I was also focused on garment knitting. 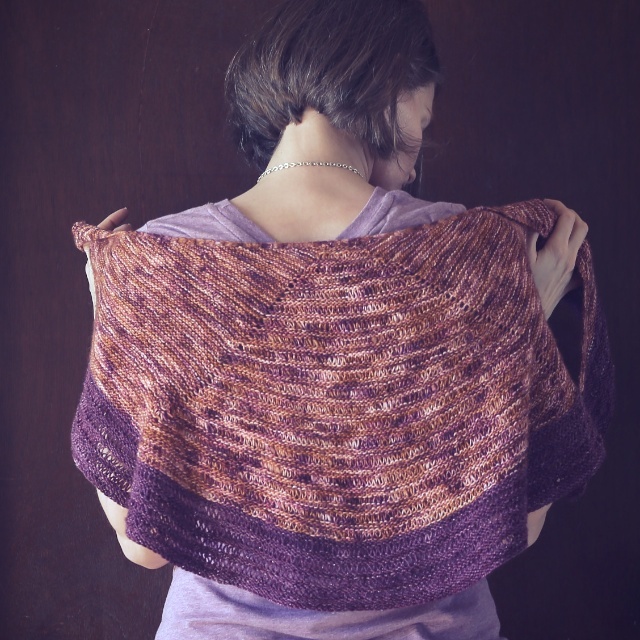 Last summer, I knit Antipodes, though, and re-thought my stance on shawls. They're basically light scarves or shrugs, which makes sense in a warmer winter. The main plus is that they allow me to use really nice yarn without having to break the bank to buy enough. A $20 skein for a versatile accessory is easier on the budget than 5 or 6 $20 skeins for a sweater! 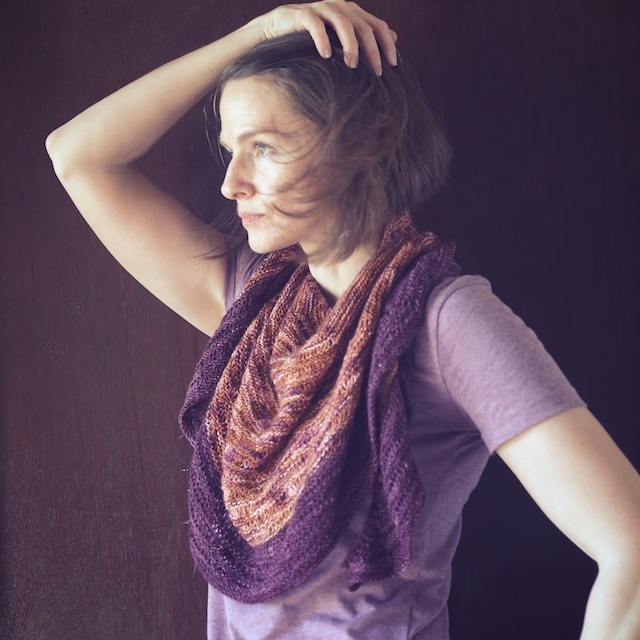 Surprisingly, Laylow was the design I wanted to knit first from the collection. It's very casual in style, but the knitting has an architectural look to it. 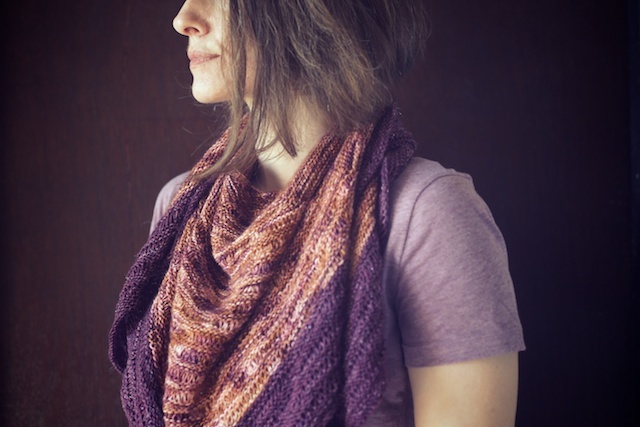 I love the juxtaposition of the two stitch textures when it's wrapped around your shoulders. Anyway, the designer, Shannon was hosting a surprise Knitalong this Spring and I was waiting to cast on, hoping the theme would fit this shawl. Since it turned out to be a Gilmore Girls KAL, I went ahead and cast on. I can see Rory wearing these subtle colors, right? Basically, GG covers just about any style of knit. and backwards baseball cap- Luke. I have to confess that I made this twice. The first one was waaay to big. 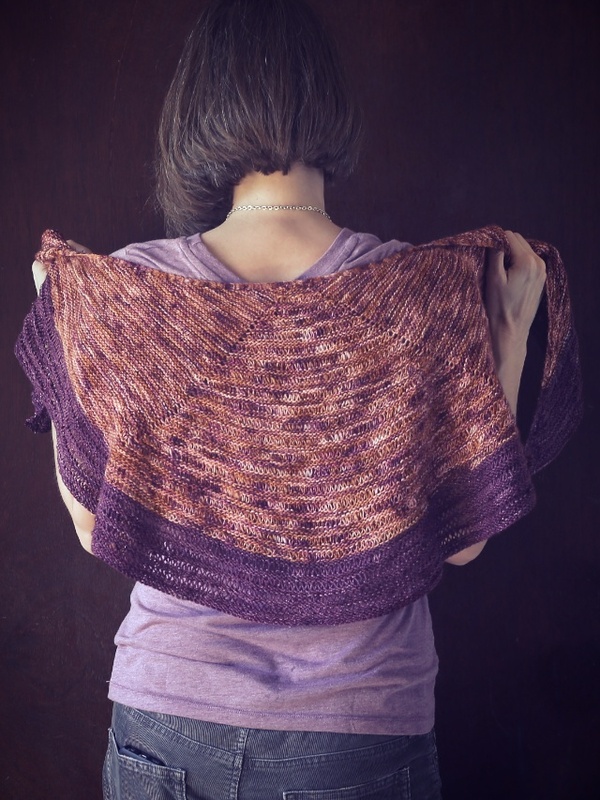 My Ravelry friends tried to encourage me that a nice, drapey shawl was great to have. Thanks, guys. That's the good thing about knitting in groups- lots of encouragement and feedback. But unless I was going to rename the shawl "Saglow" I knew I would have to re-knit it. Though I washed my swatch, I must've gotten into the knitting zombie zone and relaxed my tension. This thing was so big that I eliminated one whole pattern repeat of the main body of the shawl and it was still so loose that, after blocking, the garter didn't look all that different from the wrapped and dropped stitches. Did I say that I ruled in my last post? Let me modify that to: I try hard to be sufficient. So, I frogged it and started over. The details: The second time around, I used size 2 needles with the same two skeins of Gynx yarn. 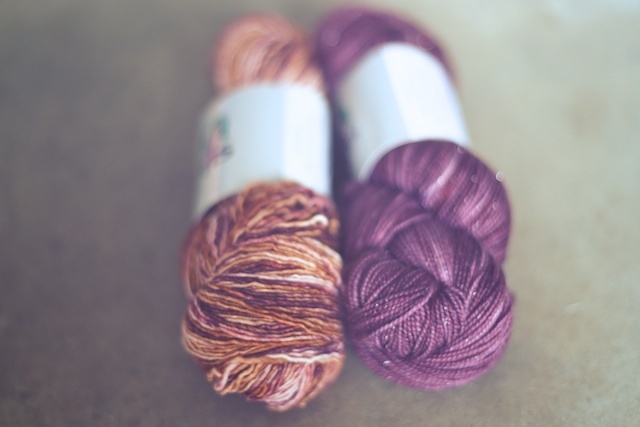 When choosing my yarn, I knew I wanted to use Gynx Yarns, but I wanted it right away in two colors that would coordinate. That's always a little scary when ordering online. I suppose if I were investing in a sweater's worth, I could email the dyer and ask their opinion before ordering. But this was just two skeins for a shawl, so I went with the Single Merino, in Caramel and Berries, and Glitz Sock, in Goth Girl, for the border. Even though they were two different bases and the Glitz has stellina, they so went together. I followed everything as directed, but I noticed my gauge was now tighter than the pattern, so I added one repeat in the body and one in the border. I still used almost the same amount of yarn for it, with two extra repeats, as in my first shawl that had one less repeat than directed. Crazy. Obviously, I was determined to have a very defined garter and dropped stitch "stripes." And I did. Blocking didn't alter the shawl as much since the yarn had already been wet- blocked before. I love, love, love it. I think I'll blast my AC all summer so I can wear it around the house. P.S. : Do you see the little gray hairs on my head? I've been noticing them the last few projects I edited photos for. It's very subtle now, but eventually it may be my excuse to full-on color my hair. Or not. P.S.S. : Have you ever googled your favorite show's fan art. It's very informative. I found sketches of Lorelai , taken straight out of her cameo in Dune. Scientific pie charts, floor plans, memes aplenty, wishful thinking, and Luke's real daughter. There's even a rendition of Lorelai's love that could have been and the most loyal or her many loves. I'm glad this worked out so nicely in the end. I am really into shawls right now as well, I wear them almost daily. So I might try to cast on for another one. I meant to ask the other day on Rav, did you knit this Continental? I notice the size 2 needles and varying gauge and it's got me wondering. Regardless, this came out beautifully -- I love the orange/magenta combo, especially. It looks so lovely on you, and I hope you wear it often! Seriously, this is gorgeous. 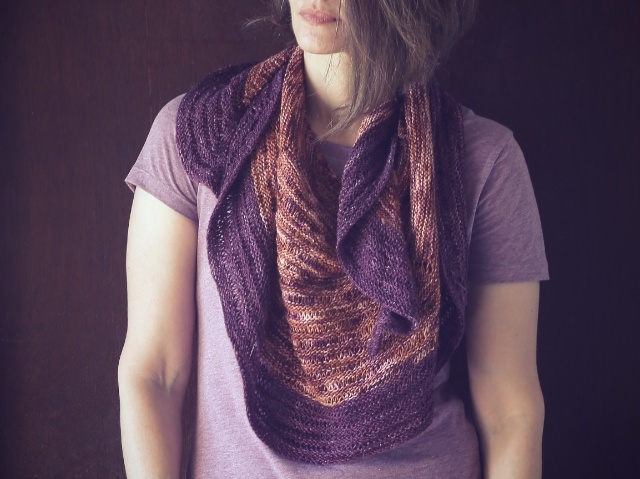 I'm more of a scarf person than a shawl person, but I'm getting more and more attracted to some of these (non-triangle) shawl patterns. 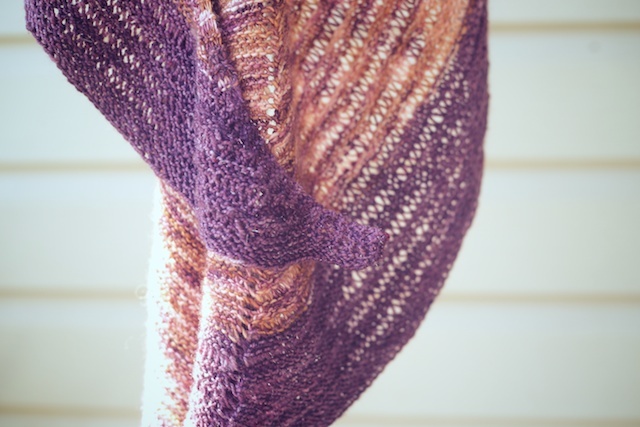 I'm absolutely in love with your colour choices, that variegated yarn paired with that purple is just perfect! It looks so squishy and cozy! Gorgeous!! Laylow is in my queue after I won it in one of Shannon's KALs this year. I would be delighted if it came out anywhere near as nice as yours Michelle! Laylow and knit twice... turned out beautiful though. Well worth knitting twice. She says, having never knit anything twice. Once mucked up, stays that way!! Love those colours. They work beautifully with the pattern. Hehe, I am here to amuse :). This did work out really well. I think I'm hooked on shawl knitting now, too. Huh, I thought I answered you, Marta, but I see I haven't. No, I was being lazy, falling back into my English knitting preference. But I've found that bamboo needles help tighten it up so much. I think I was just wrapping my yarn too loosely, when I wrapped it twice. So I minded that the second time, and, as I said, I actually ended up knitting a bit too tightly. But it all blocked out fine. Whew! When I start New Girl, I'm going continental. Thank you, Sasha! I felt the same way when I first started knitting. I still prefer less variegated, semi-solids by themselves. 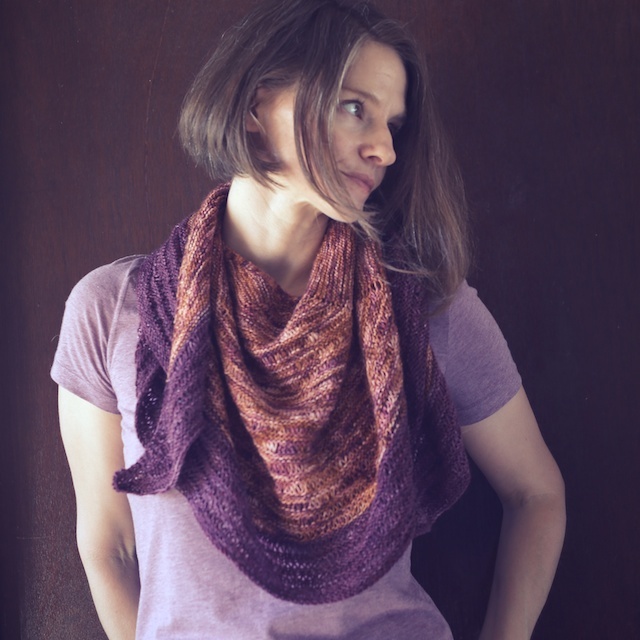 But I do love the look of variegated and semi-solids together in stripes or like in this shawl. Thank you, Heather! I feel the same about crescent shaped shawls. They're basically just scarves, right? I have a couple more on the horizon. 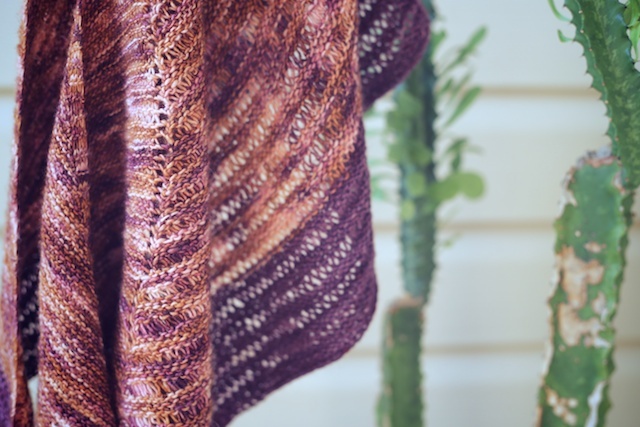 Settler Shawl and something by Veera Valimaki. Thank you, Emma! It was worth being twice knit, but I hope I don't do that too often. Thanks! 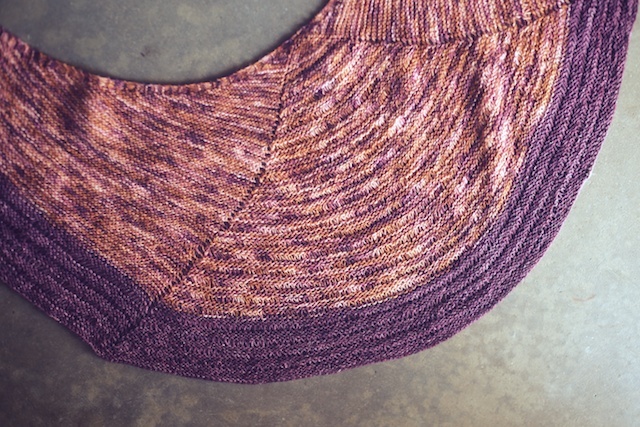 I loved working on it and the final shawl is so pretty. Wonderful design! This is a very beautiful shawl, and I can see Rory wearing it. I don't have grey hairs yet, but my mother doesn't have either so I could get lucky. My aunt, on the contrary, has many and she's not dyeing he hair nowadays. I like to think that I would do the same but off course, I'll only know when that happens to me.